Finding the right balance between good nutritional choices and great flavors, the options may be limited. Some foods might be great health choices, but taste like cardboard. Other options can taste yummy, but don't offer sound nutrition. Now there is an easy option, Simply Choices. In 2002, Cathy Richards, Founder and CEO (Chief Enthusiasm Officer), created the Simply Choices because she couldn't find a filling and nutritious snack that didn't upset her stomach. Diagnosed with Crohn’s disease since she was twelve, Cathy struggled to find a satisfying snack. “We make healthy snacks for busy people,” says Cathy. Fill up. Naturally. Longer. 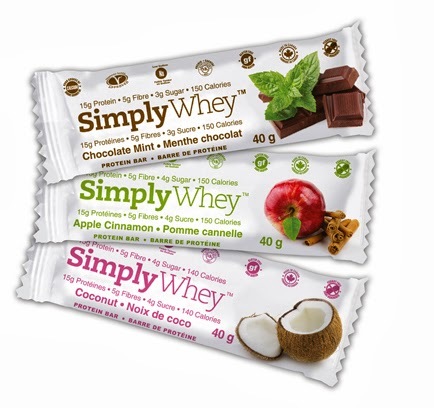 One box of 12 bars of each of our Simply Whey protein bars (Apple Cinnamon, Coconut, and Chocolate Mint) valued at $85. With the most protein for the least calories of any other natural protein bar, each bar has 15g of protein and 150 calories. All our snacks are easy to digest: gluten free, low sugar, low GI, and vegetarian. Simply Whey is also a great source of calcium. Because of our simple ingredients, Simply Whey is suitable for diabetics, athletes, weight loss, vegetarians, gluten intolerance, people with different dietary requirements and those looking for better, healthier snack options. The Giveaway will open up on 9/24 12:01 am EST and Close on 9/27 at 11:59 pm EST.